It’s highly unlikely that you’ll find Jewel of Russia Classic in your local liquor store. You’ll have to go hunting for it. Even in places that regularly carry it, it’s not always in stock. Why? Because Jewel of Russia is the Best Vodka on the Planet. To date, I have mostly focused on Best in Class, or Best Value Boozes. So you might think that I throw around “this is the best ever” a lot. I don’t. I’m a snob. I’m a wine snob. I’m a coffee snob. I’m a liquor snob. (I am not a beer snob. Come on. It’s beer. As long as it’s fizzy and tastes decent, I’ll drink it.) At any rate, me calling Jewel of Russia Classic the Best Vodka on the Planet is high praise, indeed. I’d list every vodka I’ve ever had to prove my point, but that list would be longer than this review. Let’s Not Mince Words: Jewel of Russia stands tall in the world of vodkas. It is mildly spicy, full bodied, and not hampered by the disinfectant smell of lesser vodkas. This is a vodka you can sip straight or on the rocks. In fact, it may be treasonous to mix Jewel of Russia with anything! 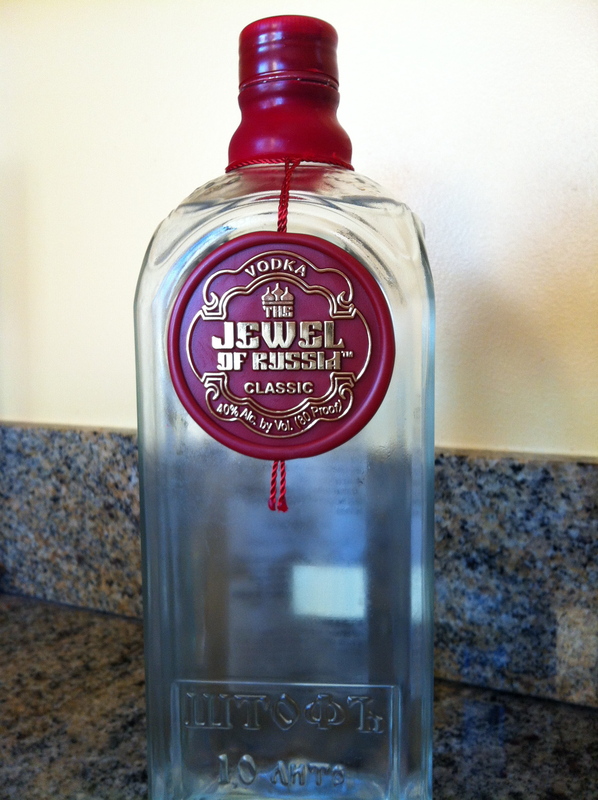 Jewel of Russia is the Best Vodka on the Planet. You already know that I like booze that has presence. Booze should exemplify its class and assault your taste buds with that which makes it unique. Jewel of Russia tickles your nose, then assaults your tongue with an AK-47… in a good way! The flavor profile is pronounced, without being offensive. You sip Jewel of Russia and you know you’re drinking a quality vodka. When shopping for Jewel of Russia, please note that you’re buying a full liter of it, not 3/4 of a liter like most booze. Still, the price might shock you despite the extra 250 milliliters. At its price point, compare Jewel of Russia to Stolichnaya Elite, Chopin, Russian Standard, Grey Goose, or Belvedere. After you compare, forget the comparisons because Jewel of Russia blows them all away. Jewel of Russia is no shrinking violet of a vodka. Its pure vodka joy is elevated to near perfection by the facts that it’s made from a blend of hearty Russian wheat and rye, it’s distilled five times, and it’s filtered five times. If Jewel of Russia were a human being, it would be the most beautiful, the most classy, the most sophisticated woman in the world. She would have jet black hair, ice blue eyes, pale skin and a wicked smile. Jewel of Russia would walk up to you sporting that grin, and punch you dead in the face. And you would thank her for it. Jewel of Russia would walk up to you sporting that grin, and punch you dead in the face. And you would thank her for it. But please, sip it on its own first. See if you can enjoy this true gem in its purest form. Its expensive. But worth every penny.